It’s always great to see social media being used for good purposes, and one woman has shown just how powerful a selfie can be. 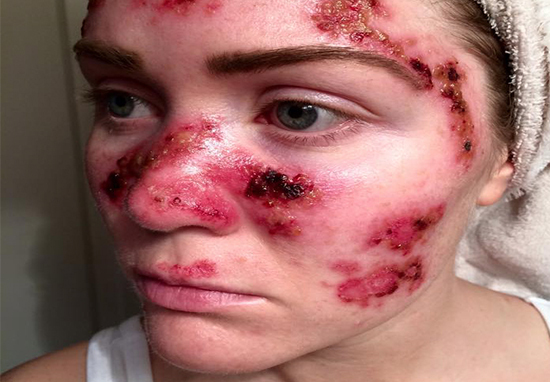 Tawny Willoughby – who now goes by the surname Dzierzek – was just 27-years-old when she shared a sobering selfie on Facebook, revealing the visible effects of her skin cancer treatment. The selfie – which was taken and shared back in 2015 – showed how Tawny’s face was covered in very painful looking red scars and scabs. Tawny’s post was shared over 105,000 times, with her stark warning resonating with people from all around the world. However, nobody realised what a far reaching effect this would have. As a teenager, Tawny used sunbeds once or twice a week and sometimes even up to four times a week for special occasions such as her prom or before going away on holiday. She was first diagnosed with skin cancer at the age of 21, and has since had to undergo various treatments including basal cell carcinoma, squamous cell carcinoma and Surgical Excision and Photodynamic Therapy (PDT). If anyone needs a little motivation to not lay in the tanning bed and sun here ya go! This is what skin cancer treatment can look like. Wear sunscreen and get a spray tan. Learn from other people’s mistakes. Don’t let tanning prevent you from seeing your children grow up. That’s my biggest fear now that I have a two year old little boy of my own. Skin cancer is not always moles, only one of mine have been a mole. Get any suspicious, new and growing spot checked out. Anything that doesn’t heal, possibly bleeds on and off and crusts. The sooner you find it the less likely it will leave a disfiguring scar or grow deep enough to metastasize. Melanoma kills, non melanoma disfigures (and can also kill). Don’t be a statistic! Two years on, a new study has figured out just how impactful Tawny’s selfie was. The study, published in the journal Preventative Medicine, revealed how Tawny’s post led to a 162 per cent hike in internet searches for the words ‘skin’ and ‘cancer’. A dramatic trend can be seen during the height of public interest in Tawny’s post. A record number of searches for ‘skin cancer’ were detected – with 229,000 searches in just one week. We conclude that an ordinary person’s social media post caught the public’s imagination and led to significant increases in public engagement with skin cancer prevention. Digital surveillance methods can rapidly detect these events in near real time, allowing public health practitioners to engage and potentially elevate positive effects. At the dermatologist, wishing I knew the damage the sun could do back in the day. Playing softball every wkd & then for @ArizonaSoftball -practicing everyday without a visor, sunglasses, & sunblock- HUGE regret. Skin cancer is for real, please protect yourself! ???? Tawny should be immensely proud of how deeply her heartfelt message has resonated. This finding just shows what a meaningful impact one person’s story can have on the world. Thanks to Tawny, more people are aware of how to spot early symptoms of skin cancer, and will undoubtedly think twice before using sunbeds. Can a selfie promote public engagement with skin cancer?